Vacation – Fish – Boat – Shop – Eat – Play – Duck Hunt – Snowmobile – Ice Fish! May 1st-February View LIVE WEBCAM where most rentals are located. Why stay at a hotel when you can stay at one of several “great location” vacation homes. 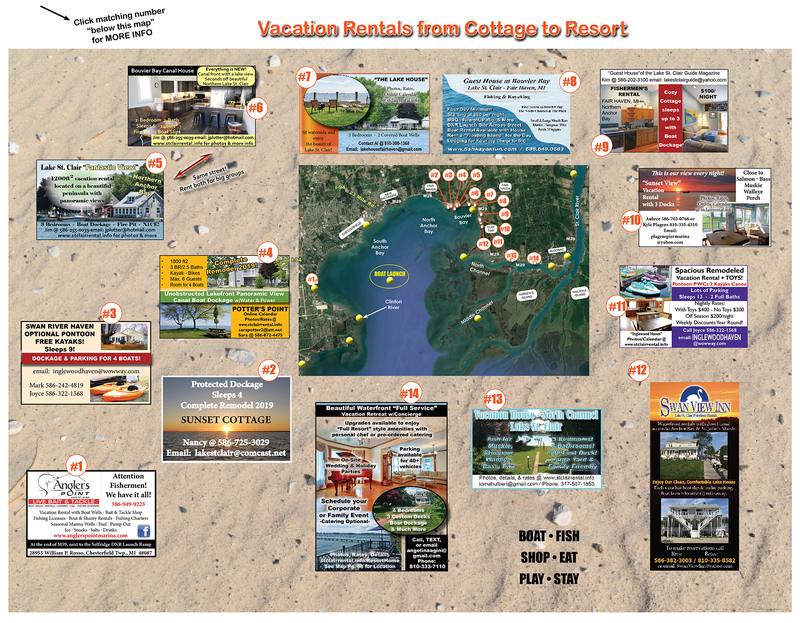 Local sponsors of Michigan’s Lake St. Clair Guide Magazine offer lodging for 1 guest to 12+ guests. Our homes provide on-site boat dockage or immediate access at one of many boat launch ramps in the best fishing, ice activity, duck hunting, & most scenic area of Lake St. Clair… or have your wedding / family reunion here! From a Kayak to a Cruiser, fish for smallmouth bass, muskie, walleye, perch, pike, salmon, sturgeon, and more. Boat around tiny islands and secluded channels and observe the many species of waterfowl and our peaceful surroundings. Swim and enjoy all your favorite water sports in Lake St. Clair’s blue clear waters! No Hidden Guest Booking Fees when reserving here direct with owners! LIVE camera May 1st – View a year of live videos here on Facebook. Do I need a Michigan Recreation Passport to Launch my Boat? What’s it like to boat here? Take a 7 minute ride in our 16 footer from the north end around part of the Flats, the largest freshwater delta in the world… passing several Walleye Fisherman on the North Channel. What are the Fishing Regulations for Michigan? Do you need a Michigan fishing license? The lake and rivers, along with the delta of the North, South, and Middle Channels are some of the greatest bass, muskie, sturgeon, and walleye fishing in the world! Call early for reservations…rooms fill up fast! The D.N.R. has now implemented a new Muskie tag that is needed to keep a Muskie. Most practice catch and release but we may encounter a Muskie that dies or we may have it in the live well and they could say that it was in our possession. So the thing to do is obtain a Muskie tag, which are free when you purchase your Michigan licenses. It is also necessary to have both the license and tag in your possession on all fishing trips! CANADA BOATING – Are there special rules if I cross over onto Lake St. Clair’s Canadian waters? Yes! Click here for complete details. Most of our guests’ pictures are from fishing Anchor Bay, Bouvier Bay, and the North Channel areas of Lake St. Clair ….